Sarah started her career with Simonson’s as a Guest Service Representative (GSR) in 2003. 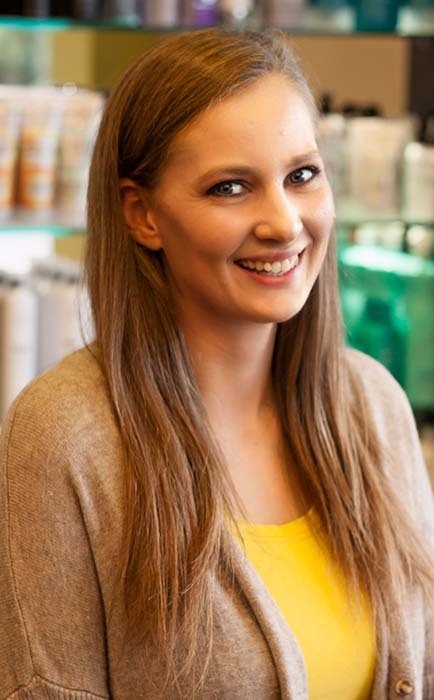 Prior to joining the team, her work experience in the beauty industry included professional product sales and service sales education at an area cosmetology school. Sarah is a seasoned customer service expert who deftly navigates the competing demands of the GSR position with ease and grace, and she is also a member of the Safety Committee whose chief goal is to ensure an environment that’s safe for everyone. Sarah was promoted to the position of a GSR Educator in 2014. In this role, she’s responsible for training and mentoring members of the GSR team to become key players in the “perpetual renewal” guest experience. Sarah defines successful GSR development as maintaining a keen understanding of the industry’s services and products, acquiring proficient communication skills and always fanning the flames of passion to keep things fresh and exciting. When not working, you can find Sarah reading and collecting real books, no Kindle or Nooks, crocheting and seeking out local bands to listen to with friends and family. She also loves spending time with her pride and joy, Cody, her golden retriever.